Ban Ki-moon rejects Haitian cholera claims: The United Nations brought a deadly strain of cholera to Haiti that killed 8,000 people but accepts no responsibility for the disaster. The United Nations is responsible for killing more than 8,000 Haitians since 2010. And it’s not even willing to say it’s sorry. The background should be well-known by now. But despite the fact that American taxpayers have footed the lion’s share of the bill for the U.N. peacekeepers responsible for this disaster—to the tune of roughly $1.5 billion since 2004—the story remains largely unknown in the United States. The place was Haiti. The mistake: a killer combination of cholera and gross negligence. The peacekeeping mission, known by its French initials, MINUSTAH, had been in the country since 2004, when it was authorized to protect an interim government installed after a coup. Six years later—thanks to a healthy dose of mission creep—the peacekeepers were still there. While rotating troops into what was now post-quake Haiti, the U.N. neglected to adequately screen a contingent of soldiers coming from an active cholera outbreak in Nepal. Upon arrival, the soldiers were sent to a rural U.N. base, outside the quake zone and long known for leaking sewage into a major river system that millions of Haitians used to drink, bathe, wash, and farm. Within days of their arrival, people downstream began to die. The epidemic then exploded, sickening more than 647,000 people, and killing in its first year more than twice the number of people who died on 9/11. The imported strain, which could turn a healthy adult into a shivering, vomiting, diarrhea-ridden puddle within hours, has since been popping up across the region. After a protracted fight and a spate of investigations, scientists were soon able to confirm the source of the infection. They found it was a perfect match for the specific strain circulating 8,900 miles away in Nepal. There had never been a confirmed case of cholera in Haiti before. To many, inside the U.N. system and out, it seemed the best thing would be to acknowledge the disaster, make amends, and move on. But that’s not what Secretary-General Ban Ki-moon and the U.N.’s leadership decided to do. From the outbreak’s first days, the officials and staff of an organization dedicated to establishing respect for the rule of law chose to lie, dissemble, destroy evidence, persuade allies to change the topic, and cajole critics. (You can read the story of my investigation, and this early cover-up, in my new book.) A more recent tactic has been for the U.N. to shut down talk about the epidemic’s cause by discussing its new effort to eradicate the disease—despite the fact that the primary program it is touting is not actually a U.N. effort, lacks clear goals, and remains almost totally unfunded. For the last year, the U.N. had deflected questions by insisting it could not comment on a pending case. The victims’ families thus found themselves in the awkward position of waiting for the organization whose negligence had killed their loved ones to decide whether it would consider prosecuting itself. Then, on Thursday, the answer came back: No. Secretary-General Ban Ki-moon added a generic statement expressing sympathy for the thousands killed and hundreds of thousands sickened or left unable to work by the disease. His spokesman dodged all further questions. 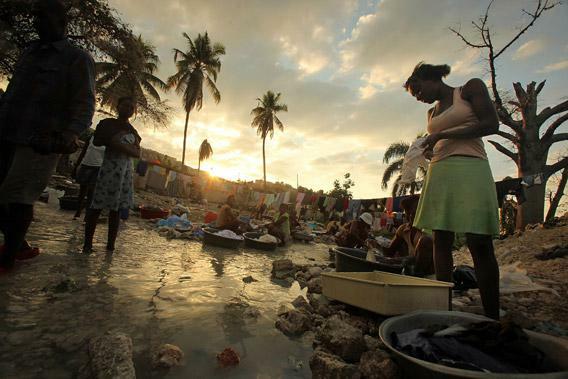 Haitians wash clothes in a stream January 8, 2011 in Port-au-Prince, Haiti. Many homes in the area were destroyed and residents have set up makeshift tents to live in nearby. Another crucial section comes a few pages later. Since the SOFA meant that Haitian courts could not prosecute U.N. personnel, it laid out a procedure for resolving disputes: the formation of a “standing claims commission.” This, too, is standard, though no one is quite certain what such a commission would look like—the U.N. has never actually formed one. It’s not clear exactly how the U.N. justified not forming a commission to adjudicate the claim, but spokesman Martin Nesirky gave a clue in his press conference. He told reporters that “consideration … would necessarily involve the review of political and policy measures.” Nesirky appears, quite vaguely, to be invoking an exemption in the SOFA, which says a commission does not have to be formed if a claim arises from “operational necessity.” Is the U.N. arguing that dumping infected sewage into a major river was an operational necessity? The U.N. press office rebuffed my request for clarification. The U.N.’s claim of immunity is ironic in Haiti, where, after all, a lack of immunity was the problem: Haitians had no resistance to the imported disease because they’d never been exposed to it before. That nightmare continues. Though cases have tapered off, there are indications the disease is once again on the rise. Haiti’s health ministry reported a spike in cases nationwide in December 2012 and January 2013, with active outbreaks continuing in three of the country’s departments. 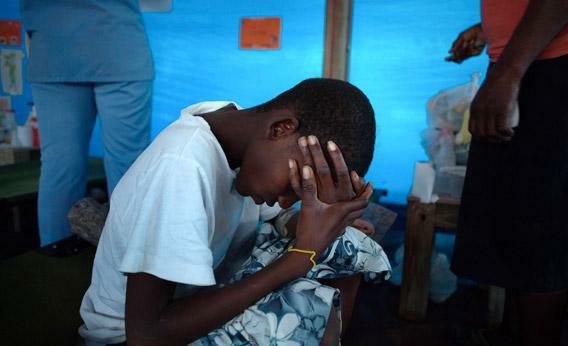 Fifteen-year-old cholera patient Jonas Florvil sits on a cot in a ward at a Samaritan’s Purse cholera treatment center in the Cite Soleil neighborhood of Port-au-Prince, Haiti, Jan. 8, 2011. It doesn’t have to be this way. Cholera, which spreads through contamination of food or water, can be prevented with good sanitation. It’s even easier to treat: Medicine is usually not required, just the speedy replacement of lost fluids. The U.N. estimates it would cost $2.27 billion to provide the necessary infrastructure in Haiti over the next 10 years. The victims’ lawyers have asked for up to $100,000 in additional compensation for each of the families they represent. In all, the total cost would probably be shy of $3 billion—a bargain compared with the economic, social, and personal damage the epidemic has brought. To put that figure in perspective, MINUSTAH’s budget for 2013 alone—again, a quarter of which is provided by the United States—is $644 million. Reduce the size of the nine-year-old peacekeeping mission, which after all is patrolling a country that’s not at war, and you could start paying that debt down quickly. So what happens now? The U.N. could decide to pay on its own, perhaps without an admission of responsibility. But given its actions over the last two years—as officials who have publicly lied about the facts of the case have been promoted while the organization ponies up a scant 1 percent of the cost of its adopted initiative—that seems unlikely, absent outside pressure. The families’ lawyers with the Institute for Justice and Democracy in Haiti—a longtime U.N. foe—have vowed to take the fight to the courts, hoping the denial of accountability will win the sympathy of a judge in Europe, Haiti, or the United States. But they know it’s a long shot. The world body will likely claim immunity there, too, and many judges will be inclined to agree. The U.N.’s interpretation of its own immunity statutes and agreements is hard to overrule. But there’s one other document worth considering in the meantime: “To reaffirm faith in fundamental human rights, in the dignity and worth of the human person, in the equal rights of men and women and of nations large and small. To establish conditions under which justice and respect for … international law can be maintained, and to promote social progress and better standards of life in larger freedom.” Those are the words of the preamble to the United Nations charter. It’s not too late for the U.N. in Haiti to live up to them.